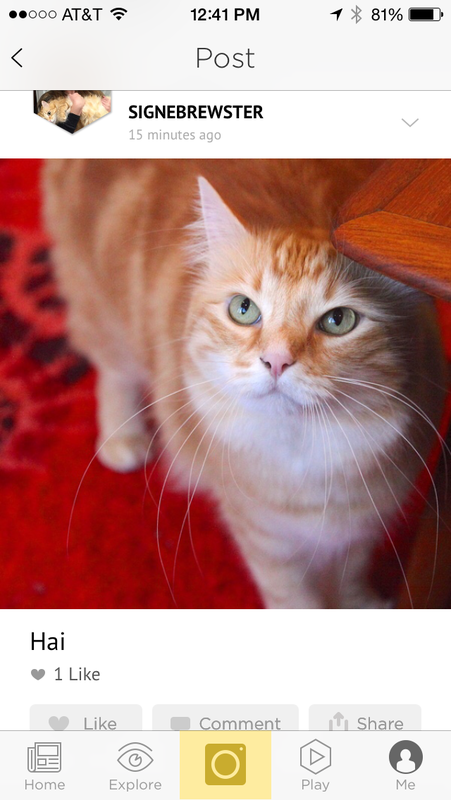 For one week, I became a helicopter cat parent. I had just placed a Petcube, a palm-sized cube that contains a camera, speaker and laser-pointer, on my bookshelf. With a few taps on my iPhone I could suddenly watch a live feed of my cat, Hobbes, from anywhere in the world. I discovered two things. One, my cat is really boring. I had imagined him jumping up as soon as we left to climb all the forbidden shelves and scratch the couch. But no, he just sleeps. Two, once I had the option to check in on Hobbes, it became a necessity. His well-being became a constant worry, instead of something to leave for when I got home. I had become one of those parents that texts their kids “hey what r u doing” every half hour. 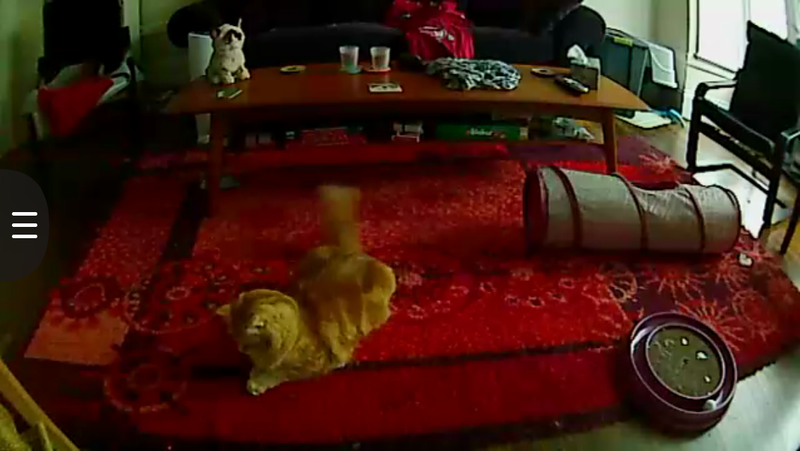 Hobbes pounces on his prey, as seen from the Petcube app’s livestream. With those lessons, I decided using Petcube during the work week was not for me. But extended trips away are another story. 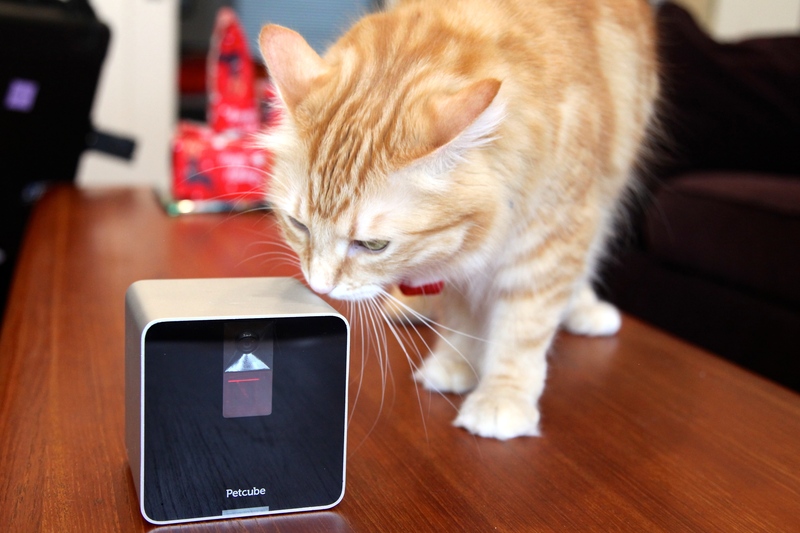 The Petcube has some nice interactive touches: It has a speaker you can use to talk to your pet. It also has a laser you can control with your phone; there’s something about watching your pet chase a red dot over a grainy livestream that makes it even funnier. And it provides just a little piece of mind that your pet is getting some exercise and well enough to run. The Petcube itself always worked well. The 4-inch cube was small enough to fit inconspicuously between the books on my shelf and setup was easy. It never lost its connection to the internet. Its 138 degree camera supposedly streams HD 720p video, but the quality of the video I received on my phone was always much lower (which is probably the fault of my phone’s connection). Hobbes checks out the Petcube. It would be nice to see a video capture feature in the future, or even a Dropcam-like setting where it would start filming as soon as it sensed motion. I never caught my cat doing anything interesting; it would be fun to get an alert when he finally does. There are already quite a few people using the Petcube social network. Petcube’s app is also nicely done. I was surprised to find it emphasizes social networking over actually interacting with the device. Sure enough, there are already people busy liking and commenting on other people’s pet pictures, which can be shared from the Petcube’s stream or uploaded. The button to access the Petcube was actually a bit hidden. Once you find it, connecting and then pointing the laser, snapping pictures and turning on audio are all straightforward. Hobbes was quick to play with the laser–apparently he doesn’t care whether it’s me or a robot behind it. Anyone can follow your posts on the Petcube social network, but you can also designate people as “friends” and “family,” and allow them to access your Petcube camera, laser and speaker at specific days and times. There is also the option to make your Petcube public for a specified number of minutes. Only one person can access it at a time. Like Dropcam and other home security devices, the Petcube does raise some privacy questions. I aimed it right at my couch, which gave it a good view of my entire living room. That meant Hobbes was almost always in the shot, but so was anyone at home. At the very least, the Petcube notes it is filming by switching a light on its front to blue. The Petcube’s $199 price tag feels a little high, but Petcube makes the setup and experience so simple that I could be swayed. It did provide some real peace of mind while traveling; just consider unplugging it during the week. $199 is not cheap by any means, but I doubt pet owners that spend that much on pet insurance would blink at the cost.